Here at Yohz Software, we offer a service to remove passwords from a SQL Server backup files (or BAK files) that are password protected. Please note that this is not the same as decrypting an encrypted backup. Prior to SQL Server 2012, you could protect a backup with a password using the PASSWORD option e.g. You would then need to supply the password when you restored the backup. An interesting point is that while the backup itself is password protected, the data in the backup file was still identical to that found in a backup file that was not password protected. Thus, using a text editor, you could still inspect the contents of a password protected backup file. The PASSWORD option was removed in SQL Server 2012 onwards, and in current versions of SQL Server, you can encrypt the backup file. Now, the data in the backup file is truly protected, and you need the correct certificate to be able to restore the backup. This is a much better and secure option compared to the old PASSWORD option. Now, if you want to restore an old backup file that’s password protected, but you no longer have the password, we can help you with that. Contact us at sales@yohz.com for a quote. This entry was posted in SQL BAK Explorer and tagged SQL BAK Explorer on November 18, 2017 by bloggyadmin. 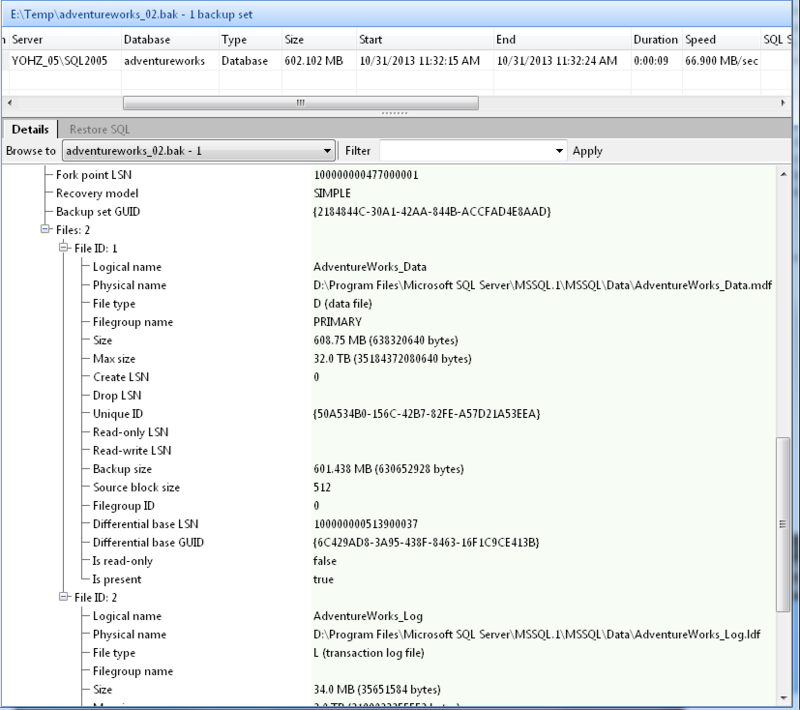 The left panel in SQL BAK Explorer is essentially a Windows Explorer clone, and shares the same features as found in Easy Explorer. In this blog, I’ll describe some of the cooler things you can do in the Explorer panel. Bookmarks! If you access a folder frequently, simply drag the folder from the Explorer window to the ‘Bookmarks bar’ area. A bookmark is created for you. Simply click on that bookmark to open the folder. Filters! If you want the Explorer window to display only files with the bak extension, simply enter bak in the filter window and click Apply. 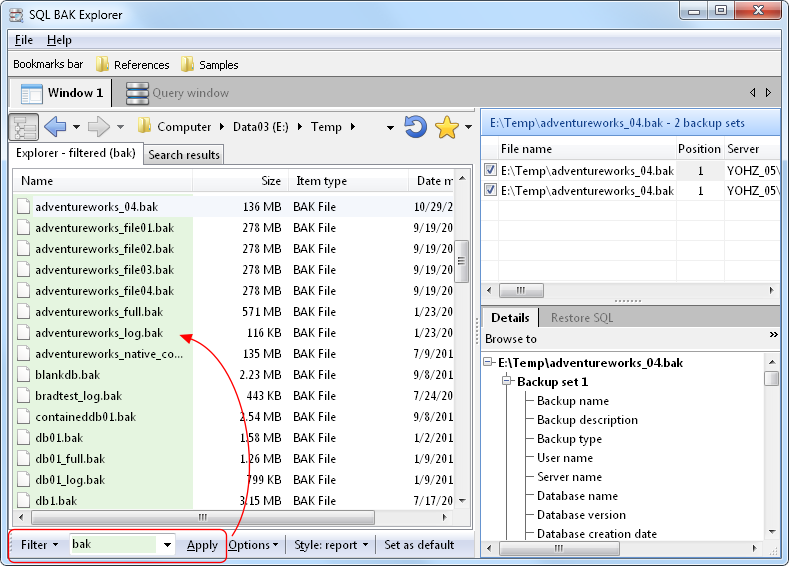 Now, only bak files will be displayed in the Explorer window in every folder you browse to. Default layouts! Say you want the explorer window to be of a certain size, the default folder to be a particular folder, the backup summary panel to be this size, the SQL Window editor area to be that size etc. First, set up the panels exactly as how you want them to appear every time when SQL BAK Explorer starts. Then click on the Set as default button. More bookmarks! In addition to the bookmarks bar mentioned above, you can also maintain bookmarks in a menu. You can group bookmarks in categories, to make them easier to organize. This entry was posted in Easy Explorer, SQL BAK Explorer and tagged Easy Explorer, SQL BAK Explorer on September 28, 2017 by bloggyadmin. 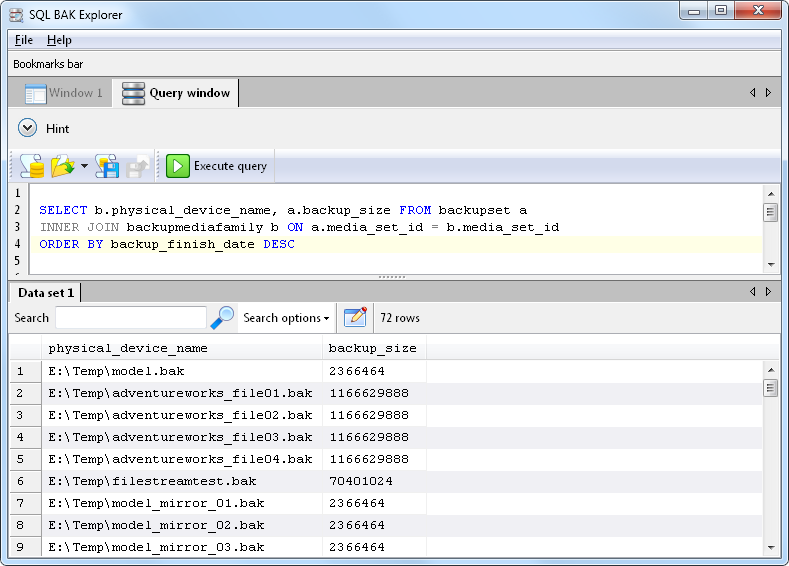 We just released SQL BAK Explorer 2.0 today, and the significant addition is that of a Query Window. 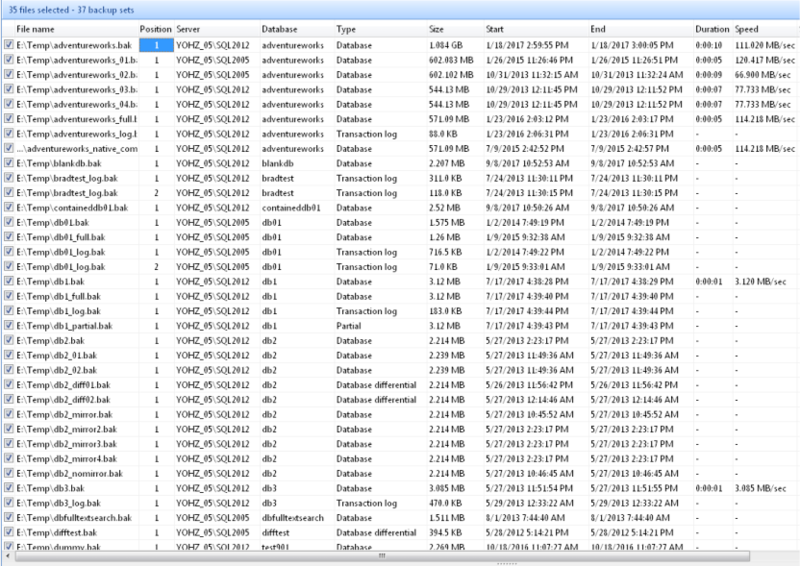 As some of you may know, SQL BAK Explorer stores backup details of the files it reads in a SQL Server Compact database. There are 5 tables used to store the details i.e. The structure of these tables are similar to the same tables found in the msdb database, so if you’ve ever queried for backup details in msdb, you’ll feel right at home here. So in the Query Window, you simply enter a query to retrieve the backup details you want e.g. If you want to return multiple result sets, end each query with a semi-colon, and start each query on a new line e.g. The SQL syntax for SQL Server Compact is fairly similar to the SQL Server syntax, so if you are already familiar with SQL Server query syntax, writing for SQL Server Compact should be easy. This entry was posted in SQL BAK Explorer and tagged SQL BAK Explorer on September 28, 2017 by bloggyadmin.